Tickets available for the Lighthouse Harbor Cruise – celebrating Artweek 2019. 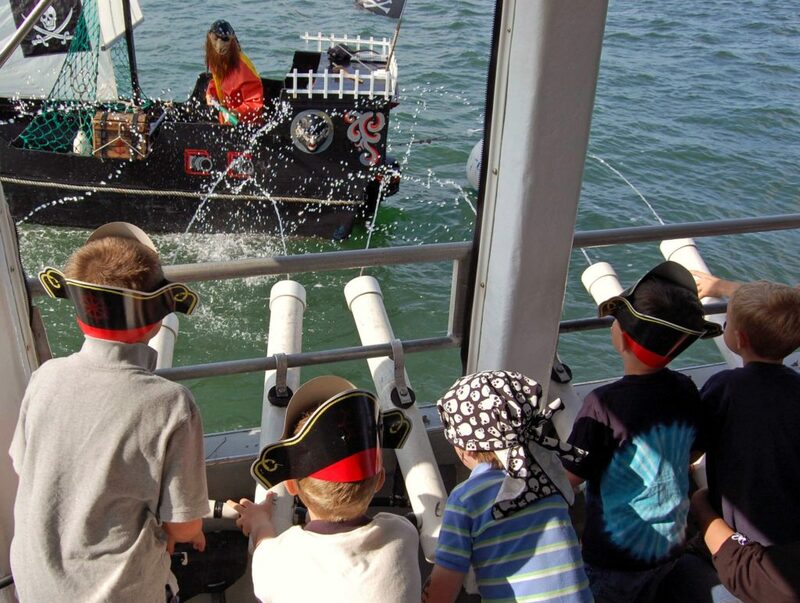 Battle an enemy pirate ship using mighty water cannons. Recapture the treasure chest filled with pirate booty. Toast your good fortune with buccaneer brew. Haul up a lobster trap and see the amazing creatures that live in our ocean. Try your luck in the crab race. Dance, sing and win prizes. Most of all, enjoy some good outdoor fun! Pirate hats, face painting, fist-full of treasure, and a toast with buccaneer brew. Age Recommendation: Children starting at the age 4 to 10. Charter rate (May through October- 1 hour) Cost: $14.00 per person – all ages – including all children and adults. $420.00 minimum cost if your group is less than 30 people. You can invite more than 30 people – 50 passengers is the maximum capacity. Deposit: $100.00 required – balance due on day of cruise – personal checks, credit and debit cards accepted. Cancellation Policy: Deposit is refundable if cruise is cancelled 14 days prior to date of cruise. If cruise is cancelled, or rescheduled to another date, less than 14 days prior to the date of the cruise, the deposit is non-refundable. Arrival: Please arrive 30 minutes prior to departure time for pirate hats, face painting, boarding and welcome orientation. Cruises run on schedule and we don’t want anyone to miss the boat! Weather: Cruise will sail rain or shine on the protected calm waters of Plymouth Harbor – the main cabin can be enclosed to keep everyone dry and comfortable – heat on board for cooler days. Souvenirs: “I SURVIVED” Pirate T-Shirts, Bandanas, Swords and Flags available for purchase before or after the cruise. Restrooms: Two clean/modern restrooms on board. To reserve: please call 508-746-5342 to speak directly with the crew or buy a Public Cruise ticket today! Click to see a short video of the cruise. Copyright © Plymouth Cruises. All Rights Reserved.